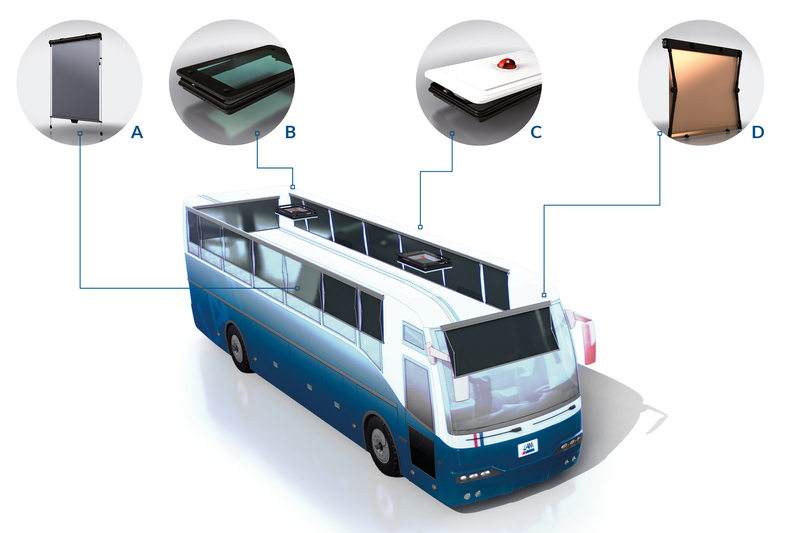 Active in the Bus & Coach sector since many years, LAM SpA is a reliable, experienced and technologically innovative partner. The Customer oriented philosophy of the company takes shape from the first phases of design, where customer commits to LAM SpA the study of custom-made solutions for the most disparate applications, affirming the company to be a consolidated partner of the major Bus & Coach manufacturers and also a partner for technical and design studies. Solution 27/7 is simple and effective, thanks to the versatile fixing, to its side guide rods and to the ratchet lever system. LAM SpA roof hatches, made in tempered glass or abs, manually or electrically operated, offer the exclusive and optimal solution for the cabin ventilation, fops certified for on board security. Solution 27/30, 12 or 24v electrically operated, can be roof or wall mounted on request, with no need of guide rods thanks to the scissor arm system with a minimal look.